Please note: Our house is strictly non-smoking/vaping etc inside AND outside. Vacation in Style! Make this fabulous house your base camp for fun . Check out our guest comments to see what our renters love about our vacation home. Our vacation Home is nestled in the new RiverWild area of Mount Bachelor Village Resort on Bend's west side off Century Drive which leads to Mt. Bachelor Ski Resort. Riverwild's location is on the western bluff of the beautiful Deschutes River with access to the many miles of river trail. Despite its secluded environment, Riverwild is just minutes from all that Bend has to offer including award winning restaurants, cinema, concerts and shopping. The Riverwild Retreat was built in late 2006 and was professionally decorated and outfitted with all new furnishings. This home is truly a welcoming delight during EVERY season of the year. Our home has 3 bedrooms, 2.5 bathrooms, approximately 2000 square feet interior, a 650 sq. ft. covered porch with deck heater, outdoor living room and lounge chairs, alfresco dining for 6+ guests, adjacent 2-car garage,large capacity washer/dryer as well as PRIVATE (on our property) Hot Tub and community outdoor saline pool open Memorial Weekend through September 30. Unlike many homes in Riverwild, our vacation home is fully air conditioned for those warm summer days! The family room features a vaulted ceiling, HD Flat Screen with Apple TV, surround sound and a cozy gas fireplace. Bedroom 1 on the main level features a King Size Bed and en suite full bathroom. Upstairs, bedrooms 2 and 3 also feature King Beds. Our 'cook's kitchen' is fully equipped by owners who love to cook! Features include granite countertops, real hardwood floors stainless steel appliances, 5-burner gas cook top, bar with 3 stools, and a full stock of utensils and countertop appliances. The Deschutes National Forest is only 1.5 miles away. For shopping and restaurants, the Old Mill District is 1 mile away and Bend's main street/downtown is located just 2 miles away. Central Oregon is an outdoor mecca for mountain and road biking, hiking, golf,equestrian, snowshoeing, skiing and cross country skiing. Trails leading to the Deschutes River Trail and the Phil’s Trail network in the National Forest are connected to the resort. A huge variety of trails are in the immediate area. Mount Bachelor ski area is just up the road 18 miles and a shuttle is available in winter. Golfers have over 20 courses to choose from! Tetherow is 1 mile away and Widgi Creek is 3 miles. There is great fishing on the Deschutes River, as well as many area lakes. Come enjoy all that the Riverwild and Central Oregon has to offer! NOTE: We do not have a telephone landline, however we have excellent cell phone coverage at our home. We are an active family of four that absolutely love all that the Bend Area has to offer year round. Before purchasing our home in Riverwild, we owned in the Sunriver area, but found ourselves spending a great deal of our 'vacation' time driving to into Bend because the restaurants were so much better and the proximity to the mountain was exactly the same! We also chose to build in Riverwild because it is adjacent to the Deschutes River Trail. It feels secluded, but is minutes away from all we need! Our home is very conveniently located, newly constructed in late 2006 and furnished with all new furniture, luxury linens, and all the conveniences of home. Unlike many vacation homes in the area, we have our own private hot tub and central A/C which is critical in the summer months. All Linens provided. Down Alternative Pillows. Large capacity washer and Dryer. We also stock Detergents. Parking for 2 cars in garage and two cars in driveway. Recreational vehicle parking is prohibited in Riverwild. We stock white towels for use inside the house. Recommend bringing pool towels for pool and outdoor water exursions. We stock most basic condiments and spices. Salt, Pepper, Flour, Sugar, Brown Sugar, Baking Soda/Powder, Vanilla, Olive Oil, Pam. Many Condiments in Fridge. Beautiful Cook's Kitchen stocked with many cooking staples. 5-Burner Gas Cooktop, Granite Counters, Stainless Steel appliances We stock plastic wrap, foil, baggies as well as many cooking basics. Beautiful covered deck with large dining table, outdoor living room. Over 25 courses to choose from in Central Oregon. Our home is closest to Tetherow and Widgi Creek Courses. Private Hot Tub on enclosed on our porch. Additional Community Hot Tub is located 3 doors down at neighborhood pool/clubhouse. Open year round. Our home has a sunken living room and stairs that may not be suitable for young children. Our home is not 'child-proofed'. We had a great week and this is a well kept and organized home. It really felt like we were at our own home - clean, well organized and comfortable. Was pleasantly surprised to find all the staples in the kitchen and the fridge stocked, including coffee, tea, condiments and even birthday candles! Great location for everything in Bend or heading to Mt. Bachelor. Hot tub was perfect. We loved the house (as usual- it was probably our 6th time renting it!) including recent upgrades with the hot tub and new, larger washer and dryer. The owner, location, layout, and amenities are awesome!! 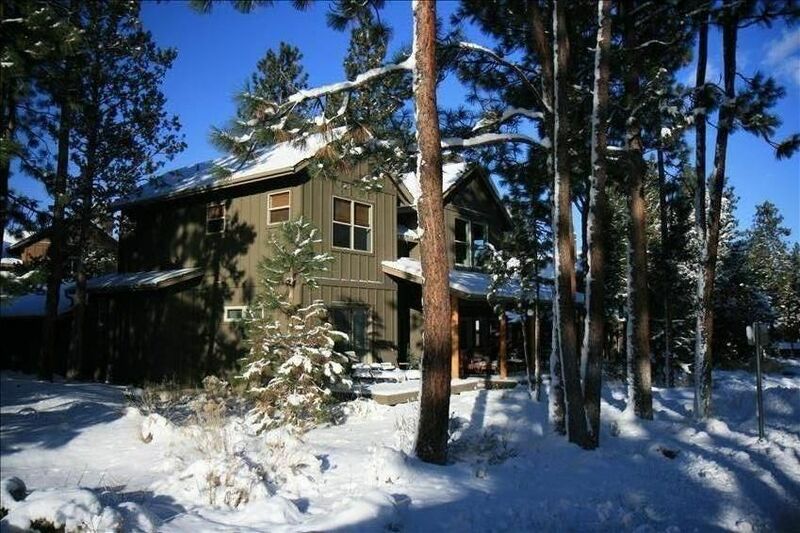 This is a fabulous house for a ski week at Mt. Bachelor! This is the second time we stayed here, and it is a fantastic house. Very clean with any and all of the items you need for a great vacation! Thank you for choosing our home once again! We look forward to accommodating you in the future! The home is well located, warm and comfortable. We were particularly impressed with how well it is furnished and accommodated. We highly recommend to anyone wanting to enjoy a visit to Bend for fun and relaxation. We’ve stayed at this house several times. It has everything we need. Kitchen is stocked, and the beds are comfortable. Thank you for choosing our home for your family’s special occasion! Hope you’ll have more time next time! Property accesses scenic Deschutes River Trail. 18 Minutes from Mt. Bachelor Ski Resort. 2 minutes to Old Mill District. Our house is not child-proofed and is not recommended for children under 3.